The p53 oncosuppressor protein is a critical mediator of the response to injury in mammalian cells and is mutationally inactivated in the majority of lung malignancies. In this analysis, the effects of p53-deficiency were investigated in short-term primary cultures of murine bronchiolar Clara cells. Clara cells, isolated from gene-targeted p53-deficient mice, were compared to cells derived from wild type littermates. p53 null cultures displayed abnormal morphology; specifically, a high incidence of multinucleation, which increased with time in culture. Multinucleated cells were proficient in S phase DNA synthesis, as determined by BrdU incorporation. However, multinucleation did not reflect altered rates of S phase synthesis, which were similar between wild type and p53-/- cultures. Nucleation defects in p53-/- Clara cells associated with increased centrosome number, as determined by confocal microscopy of pericentrin-stained cultures, and may highlight a novel role of p53 in preserving genomic integrity in lung epithelial cells. Effects of p53-deficiency were also studied following exposure to DNA damage. A p53-dependent reduction in the BrdU index was observed in Clara cells following ionizing radiation. The reduction in BrdU index in wild type cells displayed serum-dependency, and occurred only in the absence of serum. Taken together, these findings demonstrate that in murine primary Clara cell culture, cell cycle arrest is a p53-mediated response to DNA damage, and that extracellular factors, such as serum, influence this response. These findings highlight functions of wild type p53 protein in bipolar spindle formation, centrosome regulation, and growth control in bronchiolar Clara cells. The p53 tumour suppressor protein is a critical mediator of the DNA damage response in mammalian cells. In response to DNA damage, wild type p53 protein transcriptionally modulates a battery of downstream genes involved in growth control, DNA repair and apoptosis. It is hypothesised that this 'p53 response' serves to preserve genomic integrity, and reflects the tumour suppressor properties of p53 relevant to human malignancy [1–3]. There is marked tissue variability in the induction of particular p53-regulated responses, such that an equivalent dose of ionizing radiation, which induces DNA strand breaks, will induce p53-dependent apoptosis in murine thymocytes and small intestinal epithelial cells [4, 5], but not hepatocytes . Consequently, it is necessary to consider tissue context when determining roles of p53 in tumour suppression. Further, additional functions of p53 distinct from stress responses, including regulation of centrosome number and ploidy, have been reported and highlight additional, housekeeping functions of p53 in maintaining genomic integrity [7, 8]. There is controversy as to which of these functions of p53 (i.e. housekeeping or stress response) is dominant in suppressing tumour formation [9, 10], but given the tissue variability of the p53 response, a conservative expectation is that penetrance of the p53-null phenotype in either respect is cell-type dependent. This analysis reports on the effects of p53 deficiency in a subpopulation of murine lung epithelial cells, the Clara cells. Clara cells are a non-ciliated population of airway epithelial cells which reside predominantly in the bronchioles and which are proficient in surfactant production and xenobiotic metabolism by virtue of expression of surfactant proteins A, B and D and a battery of cytochrome P450 isoenzymes, the nature of which vary between mammalian species . The observation that ciliated cells develop from Clara cells [12–15] revived an interest in the Clara cell as a potential stem cell in the airways. The distal migration of Clara cells in the lungs of animals exposed to ozone, and the frequent 'bronchiolisation' of alveoli in lungs with chronic injury further suggest a role of the Clara cell in alveolar remodeling . However, it is noteworthy that Clara cells display marked interspecific heterogeneity in their distribution [17, 18]. Significantly, in rodents Clara cells occupy tracheal, bronchial, and bronchiolar epithelium, whereas primates accommodate Clara cells in only the epithelium lining terminal and respiratory bronchioles [19, 20]. It has been suggested that adenocarcinoma of the lung, a tumour of the small airways, represents malignancy of the Clara cell. Indeed, early-stage tumours of transgenic mice expressing SV40 T antigen from the small airway epithelial cell-specific promoter SP-C, a mouse model of human lung adenocarcinoma, frequently express the Clara cell markers in vivo . In human lung adenocarcinoma, where progression of the disease is histologically defined, mutation of p53 occurs early in tumour formation, possibly at a preneoplastic stage [22, 23]. Presumably, loss of p53 confers a selective advantage in preneoplastic lesions of the lung and is mutated accordingly. However, the mechanism by which p53 loss contributes to lung carcinogenesis is not understood. In this analysis, the authors explored the hypothesis that Clara cells, as a major progenitor species of the small airways, are relevant to neoplasia of the lung, and that phenotypic effects of p53 deficiency would predominate in this cell type. A method for extracting, isolating, and culturing Clara cells from the mouse has been described previously [24, 25] and was incorporated into this analysis to facilitate a greater understanding of the role of p53 in small airway epithelial cells. 5-Bromo-2'-deoxyuridine (BrdU) incorporation assays were employed to assess baseline effects of p53 deficiency in proliferating airway epithelial cell cultures, phenomena difficult to measure in vivo due to the low turnover of small airway epithelium. In addition, BrdU incorporation assays were used to characterise the Clara cell response to ionizing radiation, with the intention of identifying DNA damage response functions of p53 in this cell type. The effects of p53-deficiency were investigated in short-term primary cultures of bronchiolar Clara cells. Clara cells, isolated from gene-targeted p53-deficient mice, were compared to cells derived from wild type littermates. Briefly, mice were killed, lungs lavaged and intratracheally perfused in situ with trypsin, harvested, and incubated at 37°C in PBS for 10 mins. Subsequently, lungs were minced to 1/4 mm diameter portions and passed through a 100 micron mesh. Low centrifuge spins (30 G) removed blood cells and selected for bronchiolar cell clumps. Macrophages and fibroblasts were removed by differential attachment to charged plastic. Isolated bronchiolar cell clumps were washed in PBS, seeded to fibronectin-coated chamber slides, and maintained in this first passage (passage 0) for the remainder of the experiment. Clara cells, identified by the immunohistochemical marker CC10 (Figure 1a), were maintained in serum-free conditions unless otherwise stated. Multinucleation in p53-/- Clara cells a) Primary cultured Clara cells immunohistochemically labelled with anti-CC10 (blue). Expression of the Clara cell specific marker CC10 (Clara cell 10 kDa protein) was observed in cultures derived from both wild type and p53-/- lungs. In p53-/- cultures, two or more nuclei were frequently observed in a single CC10-positive cell (arrows). b) Primary cultured Clara cells immunohistochemically labelled with anti-BrdU. Clara cells were cultured in the presence of BrdU from plating to 24 hours culture, from 24 to 48 hours culture, and from 48 to 72 hours culture. Nuclei that had incorporated BrdU during S phase DNA synthesis were detected with an anti-BrdU antibody (brown). In p53-/- cultures, two or more nuclei that had incorporated BrdU were frequently observed in a single cell (arrows). c) Both wild type and p53-/- Clara cells displayed similar rates of S phase DNA synthesis over the first 3 days in culture, as determined by counts of BrdU incorporation (BrdU index = no. of BrdU positive nuclei / total no. of nuclei, expressed as a percentage). d) The number of multinucleated cells in p53-/- cultures increased as a feature of time in culture (multinucleation index = no. of multinulceated cells / total no. of cells, expressed as a percentage). The data represents mean ± SD (n = 3), * indicates p < 0.05 (t test). Prior to isolation for culture from adult lung, virtually all bronchiolar cells are in the G0 phase. They are thus effectively synchronised before receiving the proliferative stimulus of isolation and primary culture. BrdU incorporation was used to monitor S phase DNA synthesis in primary Clara cell culture (Figure 1b,1c). In culture, both wild type and p53 null Clara cells displayed a rise in BrdU positivity from near zero at plating (Figure 1c). BrdU indices were similar between wild type and p53 null cells at all timepoints, thus wild type and p53 null Clara cells display similar kinetics of entry from G0 to S phase. From 48 hours in culture, a proportion of p53-/- Clara cells displayed morphological abnormalities. Specifically, two or more nuclei were frequently observed in p53-/- cultures (Figure 1a,1b,1d). Counts of nuclei/cell (nucleation index) in primary cultures revealed that multinucleation increased over time in cultures of both genotypes, but was significantly enhanced in the p53-/- cells (17.2 ± 2.7 in p53-/- versus 5.3 ± 0.9 in wild type at 48 hours culture, Figure 1d). Despite the observation that multinucleated cells in p53-/- cultures were often BrdU positive, multinucleation did not reflect altered rates of S phase synthesis, which were similar between wild type and p53-/- cultures (Figure 1c). In response to DNA damage, cells undergo growth arrest and repair, or apoptosis. In many cell types, these DNA damage responses are regulated by p53. Wild type and p53 null Clara cell cultures were 5 Gray γ-irradiated and their response to injury monitored over 24 hours. Apoptosis was not a feature of irradiated wild type and p53-/- Clara cells, as determined by morphology on Feulgen-stained chamber slides at 24, 48, and 72 hours post-injury. Lack of apoptosis in the immediate 24 hours following injury was confirmed with time-lapse videomicroscopy (data not shown). BrdU incorporation – a measure of entry into S phase – decreased by 60% in wild type cells following irradiation (14.1 ± 4.3 in irradiated cells versus 46.0 ± 5.0 in controls, Figure 2a,2b). By contrast, p53 null cells maintained BrdU indices similar to those of unirradiated controls (45.5 ± 5.6, irradiated versus 45.2 ± 3.6, control). The observed growth arrest in irradiated Clara cells in serum-free conditions is thus p53-dependent. Growth arrest abnormalities in p53-/- Clara cells a) 24 hour-BrdU incorporation assays demonstrating growth arrest abnormalities in irradiated p53-/- Clara cells. Clara cell cultures were incubated with BrdU from 26 to 50 hours in culture. Nuclei that had incorporated BrdU were detected with an anti-BrdU antibody (brown). 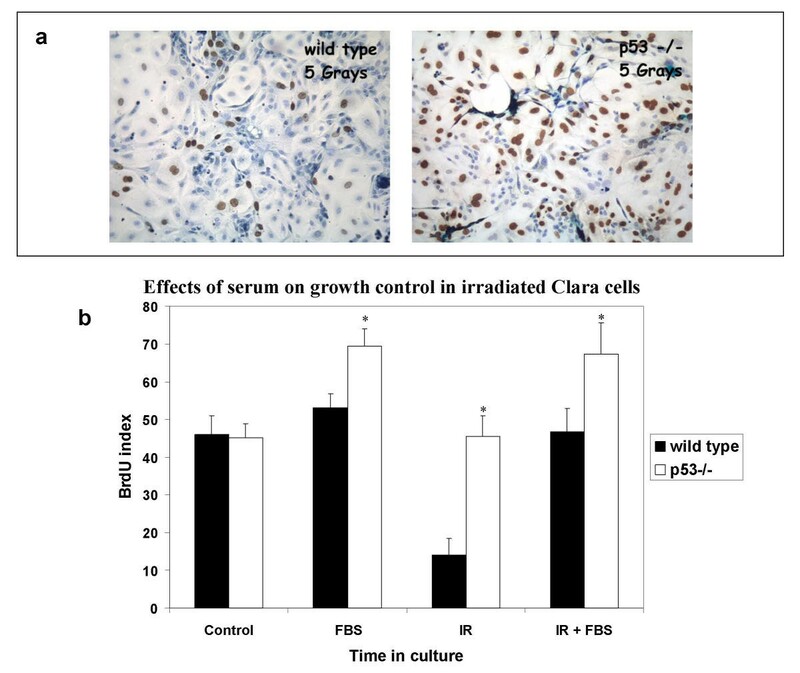 b) The growth arrest response to ionizing radiation (IR) is entirely p53-dependent in Clara cells cultured in serum-free conditions. Addition of 5% foetal bovine serum (FBS) to the culture medium abolishes the p53-dependent DNA damage response. p53-/- cultures additionally display a higher rate of proliferation in the presence of serum, highlighting synergistic effects of p53 and extracellular factors in Clara cell cycle regulation. The data represents mean ± SD (n = 3), * indicates p < 0.05 (t test). Response to DNA damage can be influenced by extracellular factors including hormones, cytokines, and unspecified serum factors . The addition of 5% foetal bovine serum to the medium was sufficient to abolish DNA-damage mediated growth arrest in wild type Clara cells, which maintained BrdU indices similar to those of unirradiated controls (46.7 ± 6.2 in irradiated cells versus 53.0 ± 3.7 in controls, Figure 2b). Thus the p53-dependent growth arrest response is overcome by growth factor stimulation. In addition, p53-/- cultures displayed a higher rate of proliferation in the presence of serum. The BrdU index of p53-/- Clara cells was 50% greater when cultured in the presence of 5% foetal bovine serum (69.4 ± 4.6, serum versus 45.2 ± 3.6, serum-free). p53-/- cultures did not growth arrest following radiation injury, but rather maintained the high rate of S phase synthesis enforced by the addition of serum (67.4 ± 8.1, irradiated versus 69.4 ± 4.6, control, Figure 2b). Neither radiation injury nor serum treatment significantly altered the number of multinucleated cells in Clara cell cultures, which remained similar to those of unirradiated controls (data not shown). Taken together, these findings highlight synergistic effects of p53 and extracellular factors in Clara cell cycle regulation. It was hypothesised that multinucleation in p53-/- cells represents a failure to undergo cytokinesis. Time-lapse videomicroscopy was employed to assess mitosis and cytokinesis abnormalities. p53 null cells displayed an array of M phase abnormalities, including multiple spindle formation and failure to segregate nuclei mitotically (for movie, see additional file). This observation prompted us to look at centrosome number abnormalities in p53-/- Clara cells. Centrosomes are essential for the formation of bipolar spindles and the balanced segregation of chromosomes. Defects in shape, size, and number of centrosomes are frequently observed in malignant tumours and are associated with gross genome instability [26, 27]. A role of p53 in maintaining centrosome number has been documented previously [7, 8]. Centrosome abnormalities were assessed by confocal microscopy in Clara cell primary culture. 48 hour-cultured cells were fixed in methanol and immunofluorescently stained for pericentrin, a protein specific to the pericentriolar material surrounding the centrosome. Nuclei were counterstained with propidium iodide. For counting purposes, single punctate spots of pericentrin-stained material were scored as individual centrosomes while clumps of pericentriolar material with multiple foci (>2) were recorded as having greater than two centrosomes. Wild type Clara cells contained predominantly one or two centrosomes juxtaposed to the nucleus (Figure 3a,3c). By contrast, > 40% of p53 null cells contained more than two centrosomes (Figure 3b,3c). The presence of multiple centrosomes and/or excessive pericentriolar material was observed in interphase, mitotic, and multinucleated cells (Figure 3b). Interphase p53-/- Clara cells often displayed a cluster of anti-pericentrin staining material, which may represent multiple centrosomes clumped together at a single pole or an inappropriate accumulation of pericentriolar material. Centrosomes in the anaphase stage of mitosis formed two (normal) or more (abnormal) spindle poles in p53-/- cultures (Figure 3b), and may highlight one mechanism by which cell division is disturbed in p53-/- Clara cells. Centrosome amplification in p53-/- Clara cells Confocal micrographs of wild type and p53-/- Clara cell cultures immunoflourescently labelled with anti-pericentrin (green) and counterstained with propidium iodide (red). a) Single centrosomes were predominantly observed in wild type cells. b) In p53-/- cultures, more than two centrosomes and/or clusters of pericentrin-staining material were frequently observed in interphase, mitotic (anaphase), and multinucleated cells. Top left) Interphase Clara cells displaying clumps of pericentriolar material (thick arrows) and a single nuclei. Top right) Anaphase Clara cell with 3 centrosomes (thin arrows) forming a tripolar spindle. Bottom left) Binucleated Clara cell displaying 4 centrosomes (thin arrows) unevenly distributed between the two nuclei. Bottom right) Multinucleated Clara cell with 3 nuclei and 8 centrosomes (thin arrows). Panel c) exhibits the effects of p53 on centrosome number in 48-hour Clara cell cultures. In this analysis, the authors sought to identify functions of p53 in proliferating airway epithelial cells. A major finding of this analysis was that Clara cells, deficient in p53, displayed spontaneous multinucleation and the formation of bilobed nuclei in primary culture. This observation highlights a direct influence of p53 on cell division, and may represent a housekeeping function of p53 in the Clara cell. Further, nucleation abnormalities in p53-/- cultures correlated with disturbances in centrosome number. Centrosomes ensure spindle polarity and thus correct chromosome segregation during mitosis , and their assembly is tightly controlled with the cell cycle [for recent review, see ]. Because each daughter cell receives only one centrosome after mitotic division, the centrosome must duplicate during the mitotic cycle of the daughter cell. In considering the similarities between wild type and p53-/- Clara cell baseline proliferation rate, it would appear that in p53-/- cultures, centrosomes undergo multiple cycles of duplication in a single cell cycle. Similar observations have been reported in p53-/- murine embryonic fibroblasts , whereby multiple copies of centrosomes are generated from early in G1. The adverse consequence of multiple centrosomes is most prominently seen in mitosis as multipolar spindles, a feature of p53-/- Clara cells as documented by time-lapse videomicroscopy (Movie file 1 – see Additional file 1). Such events are likely to impair chromosomal segregation and induce karyotypic instability by failure to form bipolar mitotic spindles. These mitotic effects of p53 deficiency may be relevant to the genetic instability and aneuploidy acquired during lung tumourigenesis in vivo . Multinucleation, although prevalent in p53-/- cultures, was additionally a feature of wild type primary cultured Clara cells. Consequently, the propensity to undergo multinulceation would appear a feature of Clara cell primary cultures, and p53 may simply act as an accelerator of this multinulceation. However, the correlations with centrosome number are compelling. Centrosome amplification was a feature in over a third of the cells in 48 hour p53-/- cultures (37.5% population) but was only observed in a minority of wild type cells (5% population) (Figure 3c). Further, all the multinucleated cells in p53-/- cultures displayed three or more centrosomes, consistent with a critical role of p53 in multinucleation. The number of centrosomes per nuclei varied considerably in individual p53-/- cells (Figure 3b), suggestive of a general deregulation of the centrosome cycle in these cultures. It is noteworthy that many of the centrosome amplified cells did not display bilobed or multiple nuclei, but were instead mononucleate. It is feasible that the latter cells attain a state of pseudobipolarity during mitosis, whereby multiple copies of centrosomes may still co-migrate to the poles and ensure proper mitotic segregation . A tenet of this would be that only a proportion of p53-deficient cells with an abnormal centrosome number would display an abnormal chromosome content. An alternative possibility is that a pathological accumulation of pericentriolar material in mononucleate p53-/- cells augments centrosome behaviour sufficiently to perturb the formation of bipolar mitotic spindles. Immunohistochemical labelling of p53-/- Clara cell cultures with a range of spindle, centrosomal, and pericentriolar markers may help to clarify this issue. Effects of DNA damage were additionally characterised in Clara cell primary culture. The authors document that growth arrest, but not apoptosis, is a Clara cell response to ionizing radiation, and is p53-dependent. Loss of cell cycle arrest favours acquisition of mutations and may represent one mechanism by which loss of p53 function facilitates tumourigenesis in vivo. However, the Clara cell radiation response was additionally dependent on extracellular factors – specifically, the addition of serum to the medium was sufficient to abolish the p53-induced growth arrest. Effects of extracellular factors on the p53 response have likewise been observed in primary cultured murine hepatocytes  and human lung cancer cell lines , and highlight modulatory effects the tissue microenvironment may impose upon the p53 response in vivo. It should be emphasised that it is currently unclear to what degree cytokines and other growth factors expressed in injured lung (including Oncostatin M, Interleukin-8, Interleukin-1β, TNF-α, TGF-β1) augment epithelial wound repair and/or the p53 response, especially in the context of hyperplastic/preneoplastic lesions. It is possible that the primary culture method described in this analysis could be used to distinguish the relative importance of growth factors and cytokines in influencing Clara cell behaviour from a genetic standpoint, and thus provide one method of determining the mechanisms underlying physiological/pathophysiological remodelling in the small airways. The effects of p53 deficiency were characterised in short-term primary cultures of murine Clara cells. BrdU incorporation assays were used to measure S phase DNA synthesis kinetics in wild type and p53-/- primary Clara cell cultures, and uncovered effects of p53 deficiency in growth control. Specifically, proliferating Clara cell cultures displayed a p53-dependent cell cycle arrest following DNA damage, which was further influenced by extracellular factors such as serum. Multinucleation was an additional feature of p53-/- cultures, and highlights a direct role of p53 in cell division in the Clara cell. The mechanistic basis of the multinucleation phenotype is currently unresolved but may reflect a defect in centrosome number, a feature of p53-/- Clara cells. The authors additionally wish to emphasise the importance of murine Clara cell primary culture as a powerful method for determining the functional significance of gene deficiency in airway epithelial cells. Generation of mice with a neo cassette inserted into the p53 genomic sequence has been described previously . p53 genotypes were established by a PCR strategy of DNA prepared from tail biopsies of appropriate lines (progeny of Het × Het crosses). Alleles were selectively amplified by using a primer for intron 7 common to both genotypes (CAAAGAGCGTTGGGCATGTG), and primers specific for exon 6 (wild type allele, GTGGTGGTACCTTATGAGCC) and the neo construct (CATCGCCTTCTATCGCCTTC). The mice were housed in plastic cages in a room with a 12 hour day-night cycle and controlled temperature and humidity. They were given a standard diet and water ad libitum. Mice were sacrificed by intraperitoneal injection of pentabarbitone. Lungs were perfused with saline, digested with trypsin, and Clara cells were isolated and maintained on fibronectin-coated glass chamber slides as described previously . Glass flasks were adapted for use with the Leica videomicroscope via the addition of a glass platform, sandwiched between the chamber flask and videomicroscope moveable platform. Clara cells were maintained in serum-free medium unless otherwise specified. Clara cell cultures from wild type and p53-/- mice were stained with haematoxylin/methyl green and assessed for morphological abnormalities by light microscopy. Cultures plated onto Lab Tek II Glass chamber slides were exposed to medium containing 40 μM BrdU for 24 hours, after which they were fixed overnight at 4°C in 80% ethanol/PBS. Cells that had incorporated BrdU into DNA were labelled by direct peroxidase immunocytochemistry utilizing the chromogen DAB. Slides were counterstained with haematoxylin and light green, mounted, and coverslipped. Evaluation of BrdU positivity in primary Clara cell culture was accomplished by AxioHOME microscopy. 500 Clara cells (sufficient to achieve a stable running mean) were counted from at least seven randomly selected fields and the results expressed as a percentage (BrdU labelling index). Cultures plated onto Lab Tek II Glass chamber slides were fixed overnight at 4°C in 80% ethanol/PBS. Slides were incubated with CC10 rabbit polyclonal IgG (courtesy of S. O'Dea), diluted 1:100 in 20% swine serum/PBS for 1 hour. Slides were washed in PBS and incubated with biotinylated swine anti-rabbit IgG, diluted 1:500 in 20% swine serum/PBS. Avidin-biotin alkaline phosphatase complex (Dako) was the final labeling agent and the chromogen was Vector Blue (Vector Laboratories). Nuclei were Feulgen counterstained, mounted, and coverslipped. Negative controls omitted primary antibody. Cultures plated onto Lab Tek II chamber slides were fixed in ice-cold methanol for 10 minutes, air-dried, washed in PBS (3 × 5 mins), and blocked in 3% Bovine Serum Albumin in PBS. Slides were incubated with rabbit anti-pericentrin IgG (BAbCO), diluted 1:100 in 3% BSA/PBS, overnight at 4°C. Slides were washed in PBS (3 × 5 mins) and incubated with FITC-conjugated swine anti-rabbit secondary antibody (Dako), diluted 1:20 in 3% BSA/PBS, for 1 hour at room temperature. Nuclei were counterstained with propidium iodide, mounted, and coverslipped. Staining was visualised by confocal microscopy. Evaluation of centrosome number was accomplished by confocal microscopy. 300 Clara cells (sufficient to achieve a stable running mean) were counted from five high power randomly selected fields and the results expressed as a percentage. After 48 hours in culture, Clara cells were 5 Gray γ-irradiated by a Cs-137 source at 33 Gy/minute. Unirradiated controls were otherwise transported and handled identically. Cultures plated onto glass chamber flasks were subjected to time-lapse videomicroscopy for a period of 24 hours. Cultures were gassed with 5% CO2/Air prior to their insertion onto the videomicroscope moveable platform (Leica). Cultures and microscope apparatus were maintained at 37°C throughout the analysis. Digital images were taken from 5 fields per flask every 15 minutes with the videomicroscope (Leica) and associated software (QUIPS, Leica). Images pooled from the resultant succession of TIFF files (Microsoft) were converted to GIF files (Microsoft) for video analysis (GIF animator, Microsoft). Videos were analysed blind for abnormal mitosis and cytokinesis events. This work was funded by the Norman Salvesen Emphysema Trust. CJA carried out the cell culture studies and the immunoassays (CC10, BrdU, pericentrin), performed the statistical analysis, and drafted the manuscript. SO developed the primary Clara cell culture method and participated in the design of the study. ARC coordinated analysis of the radiation response, and participated in the design of the study. DJH conceived of the study, and participated in both its design and coordination.